Talbott presents an imaginative origin for the early human-wolf bond and explores how that bond changed both species. All dogs, even tiny toy poodles, are descended from wolves. When wolves and humans first interacted—an interaction that, over time, resulted in the domesticated dog—is unknown. 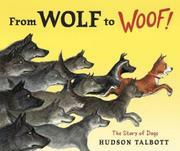 Author/illustrator Talbott crafts one possibility in his appealing story of an orphan child and an orphan wolf pup. Sometime in prehistory (presumably in Europe, judging by the child’s light skin), a hungry, howling wolf pup is thrown a bone by an orphan child who is also scavenging. Gradually the two form a friendship, and more outcast humans and wolves join them. Hunting together—the wolves surrounding the prey as the humans spear it—the band realizes that they are more successful together than separate. Thousands of years pass, and the human-wolf bond becomes the human-dog bond as dogs become the diverse breeds (all bred to perform tasks for humans) that we know today. The tight narrative and Talbott’s watercolor, ink, and colored-pencil illustrations do a good job of keeping the story lively. One bone to pick: a double-page spread near the beginning depicts a pack of wolves as much scarier visually than necessary, especially when juxtaposed against the story’s later plea to help today’s wolves survive.